For the past couple months the growth of my P. Titan has been upright and the leaves never really have the time to fully open and spread apart. I'm wondering if it's starting to go dormant? 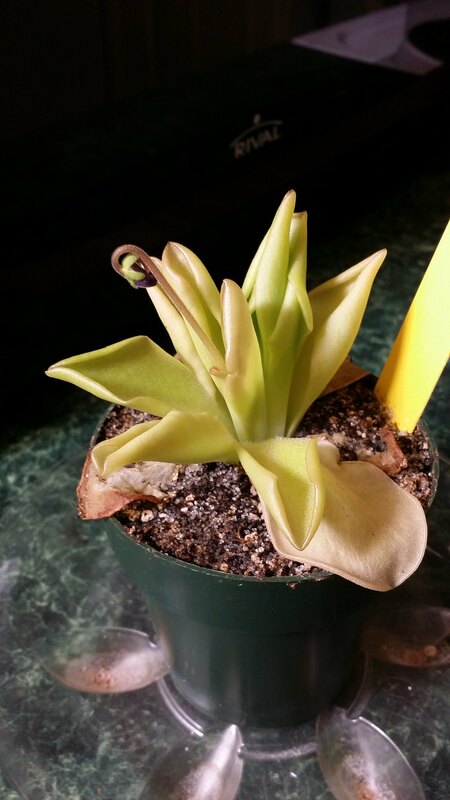 Also, I noticed a flower stalk yesterday..
Re: P. x Titan hibernacula + flower?? It does look like the plant is entering its winter dry phase - some of my Mexican Pinguicula do tend to grow more upright for a while in the beginning stages of the transformation, you may find that the leaves do start to grow more horizontally as time goes by. It seems a little odd that they aren't opening very much, they do look like they could be spreading out a bit more but I haven't grown this hybrid before so can't say for certain (I know my P. 'Weser' plants sometimes don't open leaves fully, especially in the early days of the winter dry). Just to clear up any possible concerns, how much light is the plant receiving and what is your watering routine like? The plant itself does look OK but as I've not had any experience with this hybrid, it'd be good to just rule out any potential issues. You're absolutely free to keep the flower stalk if you'd like to. It shouldn't impact the plant too much. I thought it might be worth mentioning that these plants do not form a hibernacula, that is a cold temperate Pinguicula trait. I've heard that this particular hybrid tends to get infected by a virus that leads to leaf deformities, but I can't be certain that's what's happening here. Re: Titan Arum: new seed have germinated!